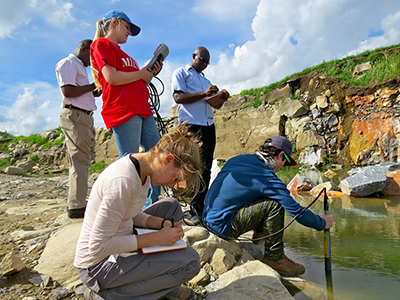 Miami students work with officials from the Zambian Environmental Management Agency measuring water-quality parameters at a groundwater dye-tracing experimental site west of Luszaka, Zambia. Students can earn a Bachelor's degree (major) and a minor in this field of study. The program offers a variety of learning opportunities including courses, summer workshops, service projects and research. It emphasizes clear, reliable and accurate knowledge about the black diaspora, critical thinking, reflection and informed action. Ultimately, the study of the unique cultural and historical experiences of Africans in the diaspora is intended to prepare students to meet the challenges of the increasingly multi-racial and culturally diverse world in which they live or will encounter in the workplace of the future. Those who seek a graduate degree may choose history, political science, English, sociology, business, urban planning, historic preservation, or law. The BWS program connects students with career specialists for post-graduate planning and encourages them to be informed participants on the job and in the community.